MEMBERSHIP: Mad Jim Jaspers (Earth-238), Coco, Conjurors, Dormouse, the Executioner (Earth-238), the Jack of Hearts (Earth-238) the Queen of Hearts (Earth-238), Tweedledope (Earth-238). PURPOSE: To rob banks and cause mayhem. HISTORY: (Marvel Super Heroes#377) - Transported across the dimensional void by King Arthur, Captain Britain and Jackdaw arrived on Earth-238 to find themselves in the middle of a bank robbery being carried out by strangely clad crooks. The heroes appeared in the vault, and spotted a clown, two men in top hat and tails and a tall man in armour standing in the middle of a hole in the wall. With no doubt that he was facing criminals, Captain Britain launched into the fight, and the clown, called Coco by one of the tuxedo men, ordered the matched pair, the Conjurors, to attack. They fired energy blasts from their walking sticks, throwing the hero back across the room, but he rallied and raced towards them once more. While Jackdaw distracted Coco, the Captain downed the twins, but the Jack of Hearts proved to be made of stronger stuff, taking a blow from Captain Britain without flinching, before striking back hard enough to send the hero flying out the room. Before he could rejoin the fray, Captain Britain was confronted by the rest of the Gang - the leader Mad Jim Jaspers, the silent Executioner, the squat and ugly Queen of Hearts, and a chuckling dwarf dressed as a school boy (this is the counterpart of Earth 616's Tweedledope, but this incarnation is never named). Informing the hero that he should not have interfered with their robbery, Jaspers asked the Queen of Hearts what should be done with the interloper, and she responded: "Orf wiv 'is 'ead!" The Executioner moved forward to carry out sentance with his huge axe, but was flung backwards out the window by the hero testing out his new powers (Merlyn altered Captain Britain's powers during the trip between dimensions) and expanding his forcefield violently. As the hero leapt out after his opponent, Jaspers ordered the rest of the gang outside in pursuit. The Conjurors took pot-shots at their high flying antagonist, before Jaspers called the hero closer to the ground in an attempt to parlay. However, this proved to be a ruse, allowing Mad Jim to throw an exploding tea pot at Captain Britain. Jackdaw witnessed this and used his mental powers to make the Conjurors drop their weapons. Though Jackdaw's influence was broken within seconds by Tweedledope, it allowed the elf to steal the twin's wand guns. The Crazy Gang pursued the elf, but were knocked off their feet when Captain Britain hurled their ill gotten (and somewhat heavy) gains at them. The sound of approaching sirens signalled an end to the fight. The Crazy Gang headed for their flying teapot under cover of a smoke bomb. 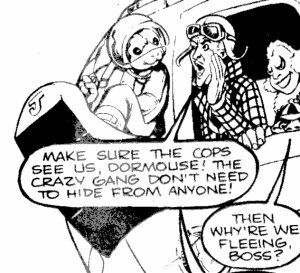 Informing Dormouse, the pilot, to make sure the police saw them so that they would know who was behind the robbery, Jaspers and his gang vanished into the night, leaving a bewildered pair of heroes behind them. 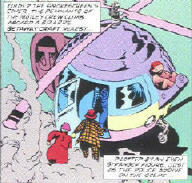 (Marvel Superheroes#387) - Some weeks later, as the world became engulfed in reality-warping chaos and Captain Britain was losing a battle with the hero-killing Fury, Mad Jim Jaspers arrived in the Crazy Gang's Teapot Helicopter, and told the hero to climb aboard so he could learn why the world had suddenly gone insane. (Marvel Superheroes#388) - Captain Britain listened as Jaspers explained that all the craziness on the Crooked World was down to him, a superpowerful mutant able to warp reality with his mind, even as the interior of the teapot warped, showing itself to contain a twisted world all in itself. None of the other members of the Crazy Gang were visible during this exposition. Eventually the weirdness overwhelmed Britain's senses, and he fled, falling out of the helicopter into a superhero graveyard, his descent witnessed by Dormouse as he continued to pilot the teapot. (Daredevils#1) - Members of the Crazy Gang were amongst the memories of the Crooked World prepared by Merlyn to be placed back into the resurrected Captain Britain. (Daredevils#6, BTS) - Lord Mandragon obliterated the entire Reality-238, presumably wiping out the Crazy Gang as well. (Mighty World of Marvel#10) - In the full throws of the Earth 616 Jaspers' Warp, Captain Britain was temporarily made to believe that he never left the Crooked World, and that he and his allies were under attack by the Junkyard the Walked Like a Man, the Status Crew and the Crazy Gang, most of the latter group riding in a flying tea cup. COMMENTS: Created by David Thorpe, Paul Neary and Alan Davis. Just because the Crazy Gang of Earth 616 are all creations of Jaspers' warped mind does not mean the Crazy Gang of this reality started that way too. It's likely, but its also noticeable that several of the 238 versions seem smarter than their counterparts on 616. In case it's not obvious, many of Jaspers' warped creations are derived from Lewis Carol's "Through the Looking Glass," from which comes "Alice in Wonderland." 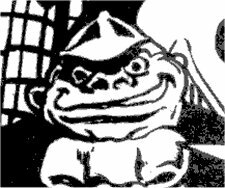 The Crazy Gang of Earth-238, agents of Mad Jim Jaspers of that world, should be differentiated from the Crazy Gang of Earth-616, created by the Mad Jim Jaspers of that, respective, world. 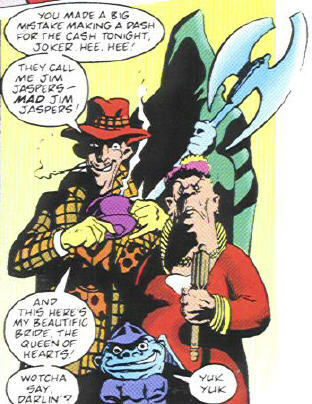 Mad Jim Jaspers (Earth-238): Profile here. 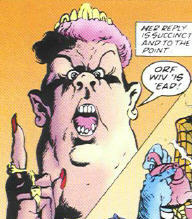 Coco: This was the Earth 238 counterpart to 616's Jester. In this reality he had a name (mentioned by one of the Conjurors) and was clearly one of the smarter members of the gang (since he was seen to give some of the others orders) He didn't display any powers or abilities in the handful of panels he was in - the abilities he displays in Captain Britain's later hallucinations don't count. 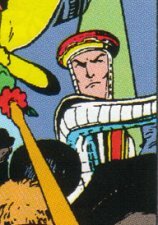 Jack of Hearts (Earth-238): Like most of the Earth-238 Crazy Gang, the Jack of Hearts seemed more intelligent than his 616 counterpart, the Knave. Otherwise he was very similar - tough enough to take a blow from Captain Britain without even flinching, and strong enough to throw the hero across a room with a single punch. The Queen of Hearts (Earth-238): As with her Earth 616 counterpart, the Red Queen, the Queen of Hearts main function in the gang seemed to be to shout a lot. Jaspers kept calling her darling; well, he is mad you know. 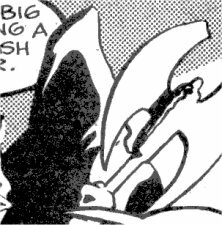 The Executioner (Earth-238): Tall, dark and silent, the Executioner's only role in life was to try and decapitate people on order of the Queen. Captain Britain threw him back through a window and he dropped a storey down the side of the building. He wasn't seen again after that point, so perhaps this injured him. 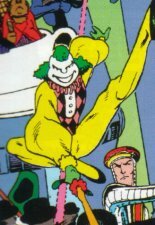 Tweedledope (Earth-238): Never named, so I am assuming he shares the same name as his 616 counterpart (not a certainty - Coco and the Jester being proof of this). His function in the gang appeared to be to pour the tea and chortle at whatever Jaspers said. 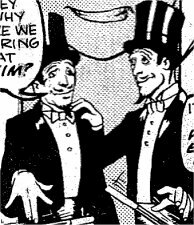 The Conjurors: A pair of identical men dressed in top hat and tails. They were armed with wands that fire poweful energy bolts. Unlike most of the gang, they have no known counterparts on 616. Loki suggests that their names might be Seigfreid and Roy, after the Las Vegas magical partners. Dormouse: The pilot of the flying Teapot, the gang's bizarre getaway vehicle. Based on his non-human appearance (and keeping in mind that the Fury would have killed any mutants years ago) he was probably a creation of Jasper's mind.